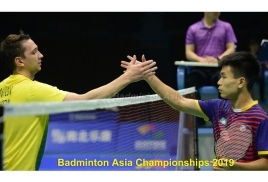 He was unseeded but Japan's Kento Momota showed why he is hailed as the next world beater when blew away Denmark's world champion Viktor Axelsen in straight games in the final to win the men's singles title in the Blibli Indonesia Open at Istora Gelora Bung Karno in Jakarta on Sunday. Such was Momota's dominating performance in his 21-14, 21-9 win over the top-seeded Dane that he virtually set the court on "fire" in the first game when took the break at 11-1 in only eight minutes. Viktor managed to add some respect to the scoreline by winning another 13 points. In the second game, it was another dominating performance by the No 8 ranked 23-year-old Momota as he handed Axelsen a below 10 score to win the USD87,500 prize money that came with the title in the USD1,250.000 world tour tournament. Viktor, 24, collected USD42,500 for his efforts. Both players went into the match with Momota taking a 7-1 lead in the head-to-head count with his win over the Dane was at the Thomas Cup Finals in Bangkok, Thailand in May when he won 21-17, 21-9 in the semi-finals. The women's singles final saw Tai Tzu Ying of Chinese Taipei regain the title she last won in 2016 after a three-game battle against China's fifth-seeded Chen Yufei. Tzu Ying won 21-23, 21-15, 21-9 in 54 minutes. There was a bit of history in the women's doubles. It was an all-Japan affair with second seeds Yuki Fukushima-Sayaka Hirota made to struggle by compatriots Maya Matsumoto-Wakana Nagahara before coming off 21-14, 16-21, 21-14 winners in 56 minutes for the USD92,500 prize money. Playing in their first final in a major tournament Matsumoto-Nagahara settled for the USD43,750 prize money for their efforts - knowing that they gave their best and badminton fans can expect more from them on the world stage. Hosts Indonesia gave their home fans plenty to cheer by taking the last two finals - the mixed doubles through Tontowi Ahmad-Liliyana Natsir and the men's doubles through Marcus Fernaldi Gideon-Kevin Sanjaya Sukamuljo. Olympics champions Tontowi-Liliyana met Malaysia's Chan Peng Soon-Goh Liu Ying and outplayed their opponents with a 21-17, 21-8 win in 38 minutes to retain the title. This is the first time that a Malaysian mixed doubles pair had reached the final in the Indonesian Open. Top seeds Marcus-Kevin ruled against Japan's seventh seeds Takuto Inoue-Yuki Kaneko with a 21-13, 21-16 win for the title.